I was recently privileged to be invited to a food photography workshop, which was organized in tandem with a taste-testing session for a line of new healthy menu options at one of Canada's leading quick service restaurants. As we speak, Wendy's Restaurants of Canada is rolling out flat-bread sandwiches, made with artisan breads, grilled and filled with lighter, more nutritional fare. It certainly is great to see another chain broadening their menu choices for the increasingly discerning customer palate. 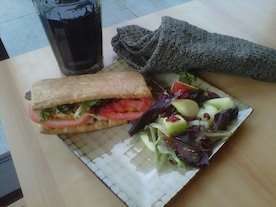 The sandwiches I sampled were flavourful, aesthetically pleasing and most filling. I commend Wendy's and other restaurants in their category for evolving their menus and for displaying a keen interest in following customer trends and accepting customer feedback. At the end of the day, their mainstay is burgers and fries and they are not compelled to offer anything more. Hamburgers will always sell. Nothing wrong with having one from their grill or your backyard barbecue from time to time, despite what the nutritional zealots may say. My opinion only. It brings up a rather hot-button parenting topic — moderation and limits. Many nutritional militants (and I respect their stance, though don't always agree with the all or nothing approach) will argue that this category of restaurants should either cease to exist or reduce their bread and butter offerrings (burgers and fries) to an after-thought. I have never understood this. People can eat what they want. The key, in my opinion, is to teach a baby, then a child to understand moderation and limits. I don't know a soul who does not enjoy a burger once in a while, including my vegetarian friends who feast on the non-meat variety. Absolutely nothing wrong with it, provided it is made as advertised — with pure ingredients. However, if that particular food is consumed too frequently or incessantly, problems will occur. Too much broccoli is not good for you either. Moderation. Limits. I am not defending fast-food chains (which is a term we are hearing less these days), I am defending exposure to healthy food and ultimately choice. As one of the producers of an award-winning DVD on healthy eating for babies and toddlers and the author of a book on the same subject, I consider myself to have an educated opinion on the subject. A child should be exposed to healthy foods from their very first bite. I'm talking about a majority of natural ingredients, freshly prepared, not pre-packaged. If this occurs consistenly, over time, you will have likely raised a person who is mindful about what they eat. Nothing is wrong with the occasional pre-packaged meal, restaurant visit or the like. Banning it completely is a mistake and that's where the nutritional zealots need to perhaps revise some of their approach. Consistent exposure. Moderation. Limits. The key ingredients in fare choice.